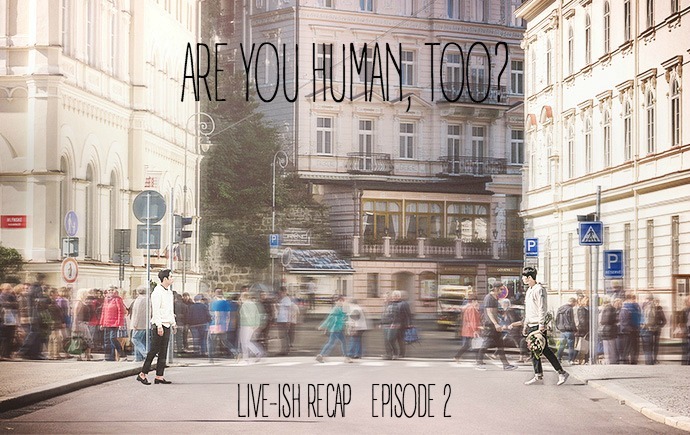 We’re trying out our live recap format with Are You Human, Too, so we will be posting it in sections just like we do our other early shows. Hopefully it goes well! We open at the end of the last episode where NS and NS3 see each other. They both slow motion look at each other in stunned silence. The taxi drives off. VO – The same human that looks just like me. The fist time I saw him was 46 minutes and 46 seconds before. NS3 thinks, Nam Sin? I am also Nam Shin. He thinks for a moment and then see a man with a gun. He searches this man, but there is no data pn him. NS says that protecting life is his first priority so he decided to save him. He follows SG around and sees Nam Shin disguising himself. He sees SG following him. He sees NS walk up to the booth and grab the white sweater and the hat. So he grabs the same white sweater and hat. then he watches from the crowd and tries to clap along. NS is able to elude SG and walk away so NS3 starts to walk away as well and lure SG away. He unlocks the traffic light as soon as he crosses which keeps the bad guy from crossing. Then we cut to the moment that NS sees NS3. 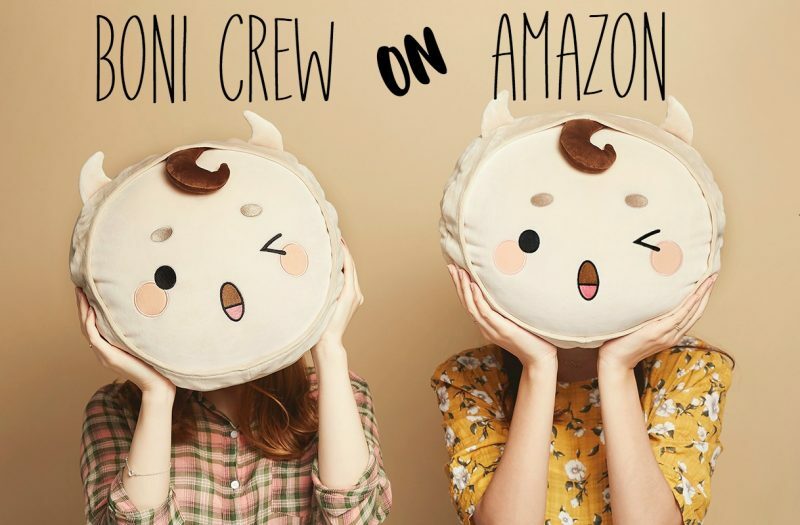 VO – Same face, same name, what does that mean? Who are you? But he gets hit by a car at that moment. Everyone reacts. David and Umma also see the after scene. Umma runs to NS’s side and starts calling his name. This is Umma, umma! NS3 says that he knows that this is the human Nam Shin, this is Umma’s son. David goes up to SN3, NS3 wanted to give his mother a hug because she is crying, but David tells him not this time, they have to get away this time. He pulls NS3 away. Umma is left begging for NS to open his eyes, please, please. The ambulance comes. David and NS3 drive away. NS3 says that he did not give Umma the flowers. David says it is okay, you can give it to her next time. Then he tells David that he saw another human following NS, he had a gun. He shows the video on the car screen. Cut to the truck driver that ran over NS. He saw NS3 in the rear view mirror and is about to tell this to GS, but GS shoots him before he can get it out. He is dead, dead. Cut to Park driving JG around. He tells GS that he did a good job, come back before anyone notices you. Then he tells JG that the job is done. YH is driving as well. He drives to NS’s house in CZECH and says that he knows he is there to see his mother. NS3 comes out to talk to YH and asks who he is. YH is all like, um are you really going to do this to me right now? Don’t you know what is happening to our company right now, because of you, GH has dementia! NS3 touches his shoulder and tells him to calm down, he is not a human. YH is all like, say what? Then the ambulance gets to the house, David drove it there. They take Nam Shin out of the ambulance and start to wheel him in. Umma sees YH and asks him who he is. David says he knows him, that is Nam Shins secretary, his one and only friend. Cut to a little while later. YH asks how Nam Shin is. Umma says the bleeding stopped, but they have to wait for the swelling to go down. They don’t know when he will be conscious again. they found the truck driver, but he was already dead by a gun shot. YH is uncomfortable with that, but Nam Shin says she just needs Shin. They have been separated for 20 years. She will take care of him now. YH tells her, if JG knows what has happened them JG will try to kill him and try to talk over the company, Shin will be in more danger. Umma says he killed her husband and now her son? YH tells her that Shin should go back.But she says there is no way. Umma thinks they have no tools. All the while, NS3 sits and listens to David. David says he searched for that guy that followed NS but he has no trace, did you find anything? NS says he did not. David says they need to keep this secret from his mother because she is already having a hard time. Umma comes in and NS3 asks her how her human is doing. She hesitantly asks him for a request. David wants to know why Dr. Oh is so serious, what is this. Umma seriously asks NS to go to Seoul and protect Shins position. David asks them if they are serious? Are they really going to send him to Seoul? NS3 says he will do what his Umma tells him. D is frustrated with this and leaves. Umma thanks him and says she is sorry. NS3 hugs her immediately. The gate opens to the large mansion. YH looks at it in hesitation. NS3 is sitting next to him in his suit. Everyone waits for them to get out. YH opens the door for NS, he walks up and bows to them all. YH rolls his eyes and then snaps his fingers. Everything disappears, this was all a simulation. YH tells him that Shin does not bow to employees,. it is his personality. Arrogant personality. Raise your head a little bit. Shin sits next to the chairman in a couch, but he fails because Shin avoids the chairman, he does not talk to him. YN wants to kiss him, so Shin tries to kiss her, but YH says she is his fiancé, but she is just like a sister to him, so no skinship. They continue practicing. This time it is about how Shin wears clothing, he doesn’t button his shirt all the way up and he stands to the side. he got it! They go back through the other simulations. WhenGrandpa comes in, he leaves. When HD comes up to him, he ignores him, when YN wants to cuddle with him, he chuckles and keeps walking. He looks good, really good and he is ready. YH tells him that he looks like Shin, this is good. Grandfather goes to the hospital and gets his result from his doctor, he has the begining stage of alzheimers. He needs to take medicine for it. Grandfather wants to know if he can still do the presentation. His daughter thinks he is crazy, is he going to show the world that he has dimentia? That he will call for his dead son? The daughter and doctor reccomend that JG do it as planned. Cut to JG preparing for the event. He talks to several people about it while standing in the spotlight with all the computer and everything behind him. The old people want the spotlight on JG but the automatic driving people want the spotlight on the car. Is the spotlight him or the car? JG tells them that they need to follow theoriginal plan where he does the presentation and then the car comes in. They all leave accept his daughter who looks at him like he has poo on his face. She wishes that Oppa gets the spotlight, not appa. She says she will go to Oppa now. This makes JG look nervous, did Shin contact you? She says no, but she thinks she knows where YH went, he went to get Oppa. JG tells her to let him know if she needs anything. She is all like, thats fine, my luggage shuold be there now, bye. Meanwhile, SB is trying to get a new job but it looks like everyone knows that she was fired from her last job becasue she had a hidden camera on her last client. This guy works for a department store security team, but the team leader does not think she would be a good fit. Maybe she will sell out their VIP members. Cut to the MMS gyme, SB tells the guys fighting to poke eyes and all the illegal things when the judge is not looking. Her father looks at her like she is clueless and then tells her to come to the back. he tells her that this is her first day at work so why is she there, did she make another mistake, did she take another hidden camera? SB says she was fired because of that hidden camera stuff and won’t be able to get a job in the future. Appa sarcastically tells her that she did a good job with that hidden camera. She tells him that she isn’t going to do it again! they yell about that. Appa tells her that once you are trash, you are always trash. SB stands up and says she will sue him for hitting her! Then she will get a lot of money! Appa hits her in the head as well and tells her to sue him so he can go to jail. He walks back to the gym. Inside the little office there area lot of posters os SB up for fighting championships, so it looks like she was a headliner in the MMA world once upon a time. SB goes out and drinks a lot. She yells at every PK Group item she sees. But she is also on the phone with the reporter and apologizes for that. JO is all like, no need to be sorry, PK Group did everything. She is kneeling down in front of Hongdae, she needs to confess to her, that hidden camera…..NS did it. NS did it on purpose to make himself trash. All the money, NS gave it to me. So he knew that I was taking a hidden camera and pretended like he did not know and hit me? That A-hole! I am going to see PK right now! Hey, Reporter Jo, you are out from my life! She hangs up and calls the MMa fighter at her gym. She tells them to give her a hand and she will buy them a nice BBQ meal later. The person that did all this work for this automatic driving project was NS, but I am here in his stead because he had an accident. I am PK Groups executive officer, JG. He starts into their presentation about automatic driving cars that drive themselves and give breaks to humans. It is the M car. The car pulls into the room from the opposite end, so it drives past everyone as if on a runway. Everyone claps from their seats as they watch it. The car is also automatically driving itself to the front. It gets to JG and then spins around on turn table. No one is driving the car. the door opens to show no one there. The back seat opens too. But then Nam Shin gets out. He smiles as he looks at JG then closes the car door. We see his watch on his wrist. Everyone is stunned to see him, but no one is as stunned as JG. YH shows up to the tables and tells the sister and Grandfather that nam Shin wanted to show up dramatically. NS3 scans the audience and gets all their ID’s. then he thanks JG for working in his stead, he tells the audience to applaud for him. then he starts talking to the audience. He tells them that they can do this presentation with him. He is Nam Shin, the executive officer for future planning. He bows to the crowd. Outside, the MMA guys hold up signs saying that she is not a conartist, stop saying that about her. One of the MMA guys wonders how long they will have tostand there. the other one says he is fine. Her dong-sang bodyguard tells eunnie to stop, if NS comes out then he will be very upset. SB’s rage pops out, He is inside! Inside the presentation, NS3 explains everything about the car. You can do everything, even skinship, but you can put the windows in manners mode. Everyone laughs. JG asks about accidents, what if the car has one. the sister tells him not to ask that! But JG smiles and says they should as it before the reporters do. then he gets up and asks about a motorcycle accident. What if two motorcycles are driving next to it. One has a helmet and the other does not. Which one should you hit? Someone says the one without the helmet is breaking the law, they shouldn’t punish the one with the helmet. JG asks what they should do. NS3 says that is difficult, should they do rock paper scissors? Everyone laughs. NS says they should change the question, the one with the helmet is 100 and the one without is a teenager. So just because the teenager didn’t abide by the law me and he should die? Humans decide who to kill. Humans have the position to decide life. Humans, coincidence, and fate….but PK will always be beneficial with humans with their own choices and be an able god. The miracle starts from PK, he dramatic change will start from our M car. (so he doesn’t really answer the question, he just rephrases it and sways it in a nice way). Grandfather gets up and claps. then everyone follows along with their clapping. It is a wonderful moment. Until SB yells that Nam Shin is a dog, from the rafters. The aunt recognizes her as the girl that Nam Shin hit at the airport. JG tells her to let Nam Shin take care of it. SB goes all the way to the front and tells him that he asked to take the hidden camera and pretended like he did not know and used violence against her. Are you pretending like you don’t know? NS3 searches all the information about her. She says eh had some fault as well, but she is treated like trash everywhere she goes and he was just playing with her. She is not a toy robot that he can play with and throw away. How funny was I to you! How funny was I to not know anything! He walks up to her. She braces herself to be hit again. But he hugs her instead. Halabogi is happy. Everyone else is stunned. NS3 tells her that his rule is that when someone cries, he hugs them. SB is escorted out and dropped off with her friends. She is in a state of shock. Her friends as her why she is like that, did he hit you again? they motion to go inside but she stops them and tell them to leave. they ask her what happened and then they also tell her to keep her promise. She hops up and yell that she told them to leave! DO you want me to burn your hand in a Samgyupsal pan! They run away from her. SB starts yelling at herself, is he using me to clear his image also! She spins around and sees JO waving at her. She immediately runs up and matrix kicks her right in the face! JO flighs. The reporter says he enjoyed the reconciliation with the violence victim, was it all planned? YH says it was not planned, but he did regret this a lot. Aunt thinks NS is a little strange, he never hugged anyone. JG says he went abroad and matured a bit more. But Halabogi says people don’t change that easily. the family walks up to NS. Halabogi tells him that he just comes and goes as he wishes, why did he come back early. He should come back for his funeral. NS3 thinks about the information from YH, he should not talk to halanogi. So he ignores him. Then he chuckles and tells his aunt that she pretends like she is a good person in front of grandpa. JG walks up with a smile and takes NS’s hand. He tells him that he should not argue on this good day. NS winks for a moment, that is a signal of lying. Flashback to Umma telling him this. He has signals for all the biomarks to know when someone is lying. Umma tells him that people lie without showing their facial emotions, don’t be fooled by him. NS pulls his hand back and tells JG that he is lying, he did not want NS to come back, he has a lie detector. YH is all like !!!!!!! But aunt laughs and says he embarrasses people very creatively. Grandfather tells him to watch him mouth. JG chuckles and says that maybe NS hates him for some reason to make a joke like that. YH tells NS that he went too far executive officer. Umma is riding in a taxi and comments that Seoul changed a lot. The driver tells her to come back often, it is her home country. She gets a call fro David, he tells her to check NS and see if he is okay in the new environment and then come back. They hang up. David apologizes to NS and tells him that he is also in a strange and new environment, wake up, you and your mother will suffer more than him. Uncle goes crazy on Park. He breaks a lot of things and hits Park. he needs to find out what went wrong. If SG lied to them then they need to find him and kill him. Park tells him that he worked with him for a long time, it shouldn’t be a lie. But JG tells him that he said he got hit by a truck, yet he came back and humiliated him in front of everyone! Park apologizes. Then he brings up the secret that is from NS, is this related? Maybe he knew it? JG says fortunately where he went was different from that matter. Park asks if it is about the father thing that he should not know about? JG is about to hit him again. he tells him to not be so suspicious and contact him first. Park says yes and leaves. JG swigs another wine bottle then breaks it against the wall as well. YH walks into the office and tells NS3 that he should not smile like that nd he should not hug people. NS3 says his principle is to hug. YH tells him that he is there to be the real Shin, your mother told you to be here and your mother is more important than any principles. No one should know that you are a robot, am I correct? YH sits and smiles at him, he tells him he did a good job. NS3 is surprised that YH can smile. YH tells him, maybe he is a little relaxed now. He also tells him that YN will be there. YN pops into the room, NS3 tries to remember how to handle her. He doesn’t ignore her but he also doesn’t give her skinship. JO steady follows SB around. But SB is so upset at her and asks her if she would like an arm bar? A rear naked choke? JO is all like, no, no, no, no. Let’s just see NS and asks him to remove her from the blacklist. She will feel better if she sees her working again. She will give her all the money from the hidden camera incident. SB asks, what if he ignores her also? JO just grabs her by the arm and tells her to follow her. They go to a VIP event and enter with their press pass. this VIP event is at a dance club. The club is filled with people and the music is popping. Beautiful women are on stage with holograms in front of them. NS is there with YN and YH. YN tries to hold on to him but he tells her that she is like his sister. That makes YH laugh a little. She tells him that she can be a sister like wife, lets get married. SN scans the crowd and sees a firecracker among the drinks, he wants to run and save them, but he is stopped by YN. he needn’t worry because SB stops the girl from lighting her firecracker. The girl calls her an old eunnie and tells her to go away. She bumps her which makes SB drop her poster. YN picks up the poster, takes one look at it and rips it. She knows she is here to see NS. SB asks her who she is. YN says she is the public relations director, Seo Yena, she is is fiancé. SB calls her the stone Buddha that doesn’t care about all the scandals of her fiancé. YN tells her that she won’t see Oppa. SB is all like, you are only the fiancé, you never know when an engagement will break. this gets to YN, they start to argue back and forth about the slapping and hidden camera. SB yells that she wants to talk to him. They appear suddenly. JO walks up to NS3 and tells her that you know me, I am reporter JO. But NS does not know her. SB tells her that she told her he would ignore her. But then YH taps JO on the shoulder and tells her that she is reporter Jo? Can she come with him? She does. NS goes with them as well. YN and SB look at each other in disgust and then turn their backs. In the back, a lot of women come out singing and throwing their arms in the air as they hold a firecracker in a bottle. but one of the firecracker bottles falls to the ground, they are too drunk to notice it. In a lounge area, YH and NS3 sit with JO. It is a very large hotel like lounge. JO says he knows everything about NS, but he does not know about her. JO says it is good that he pretends not to know her. It would be a big issue if everyone knew that the entire thing was planned. But think about SB, she was just a sacrifice, why are you stopping her from working? YH says he will take care of it, have another drink. The camera pans to NS3, it looks like he is thinking about something. YN and SB accidentally go to the bathroom at the same time. they are about to get into it, but then the lights go out suddenly. Everyone runs out. there is a fire! SB quickly wets a lot of napkins with water. The kitchen also runs out, but they accidentally leave the gas on. The burner goes out in the kitchen so the gas just keeps shooting out. Soon a huge explosion goes off. Everyone tries to get out. SB tries to help people She tells them to cover their mouthh with the wt towel and leave. YN wants to get her cell phone, but SB tells her that she can’t go back, just cover your mouth and leave. SB helps organize everyone and makes sure they all get out safely, but she drops her necklace somewhere. She is able to spot it on the stairs, so she runs to get it and then turns to get out. But another huge explosion goes off which knocks her down. She can’t get out. YH tells the reporter that they should probably leave now. But then someone runs in and tells them that the building in front of them has a huge fire, everyone is escaping. They all run out. YN sees oppa and tells her that he worried about her! But YN ignores her and scanns the escapees. His eyes turn red as he heads intot he fire. YH runs and grabs him, he tells him it is dangerous, he shoudn’t go in there. But NS just pushes him away which sends YH sliding along the floor. Cut to Umma getting a phone call. She tells YH that he is in disaster mode he won’t remember anything momentarily and will spend all his energy on saving people. he walks to the door with purpose and tries to get in. It is locked, so he has to push the door open. he pushes it completely off of the wall and goes inside. At the same time, the rafters fall and land on SB. She is trapped. NS walks into the room and checks who is stable and who isn’t. One person is fine (the fire starter) but tell him to save her becaue the other will die anyway. NS takes of her shoe and throws it, he tells her to save herself. He then goes to help the others. Meanwhile, Another big thing is about to fall on SB. She watches it as it is about to hit her and hides her face as seh prepares for impact. But it doesn’t hit her, it stops halfway. SN stops it with his back! He slowly pushes it back up against the wall. SB watches all of this happen. NS3 then moves all of the rafters off of SB and helps her up. He carries her in his arms. Her heart starts beating hard in her chest. SB – Don’t be mistaken, it is your heart that is beating. they stare at each other for a moment. Then the camera scans to his back, his circuits are exposed and are shorting. JG – YH, what are you doing here, keeping secrets from me. YH – You can’t come in, you can’t come in! You can’t come in! SB – Is this dog Nam Shin. he changed and doesn’t remember what he did. SB – Hire me as your body guard. 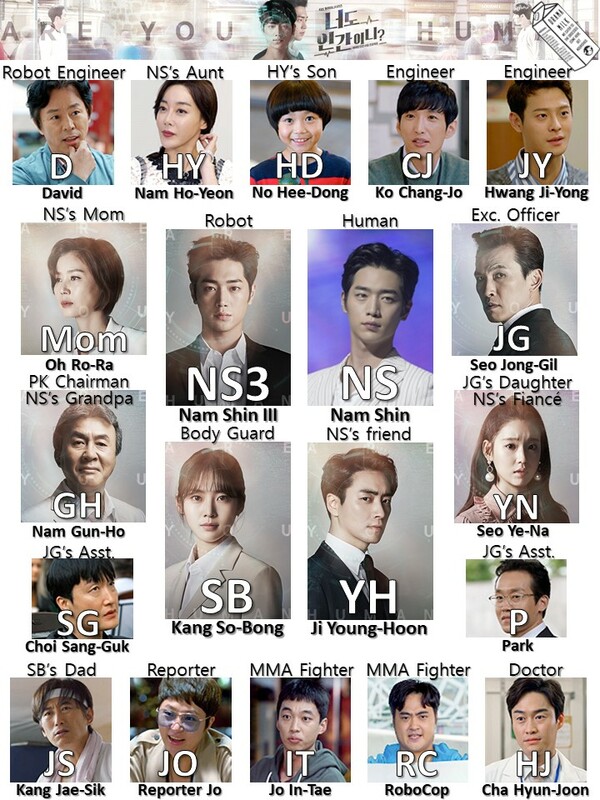 SB – Dog Nam Shin, if I see anything wrong…. Your recap concepts are fabu!